I have so much fun gathering up ideas for repurposing items on the Goodwill Tips Blog and look forward to showcasing these ideas for you each month. 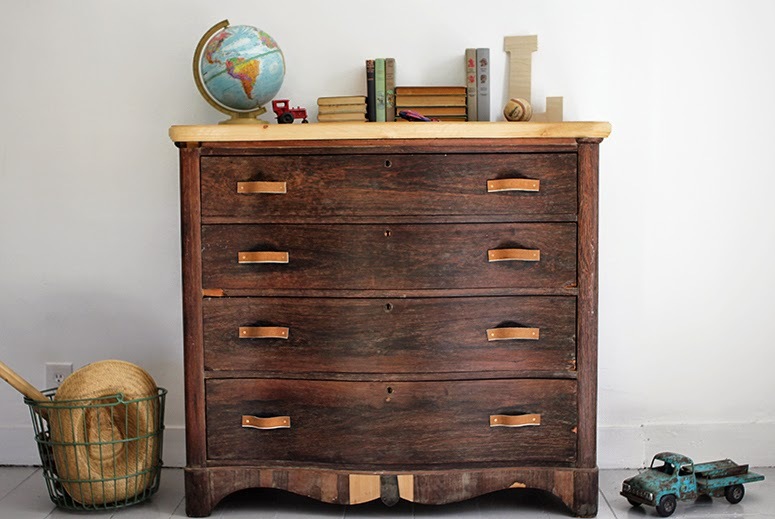 Today's post is all about a furniture staple...the dresser. I have gathered 8 fun ways you can you can makeover a Goodwill dresser that I know you will want to run right out and find this thrift store gem to create a new fun piece in your home. 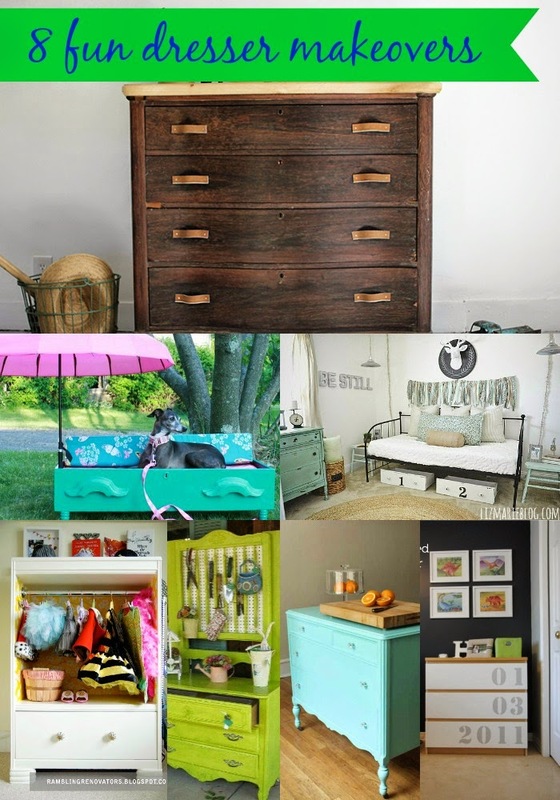 In fact, I can't wait to snag a dresser myself so I can implement these ideas in my own home. Kitchen islands can be quite pricey, but they don't need to be. A dresser can be made over into the perfect kitchen island for your home with a fresh coat of paint. A kitchen island made from a dresser offers ample storage for table linens and silverware as well as a generous top for a cutting board, fruit bowl, or cake stand. 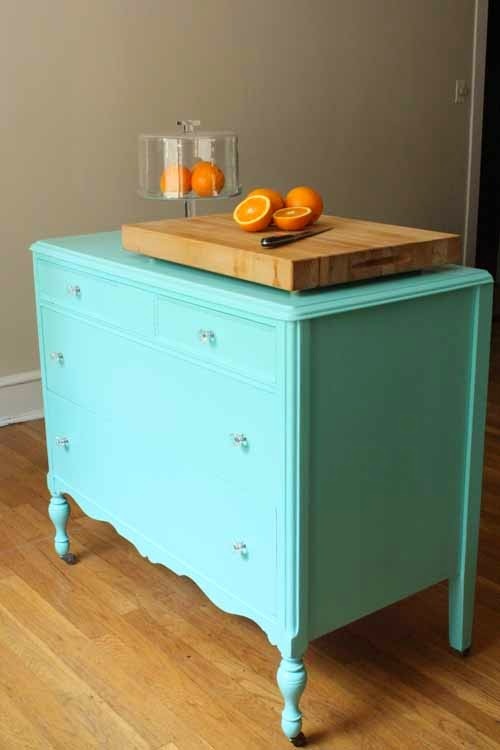 I love this beautiful mint green kitchen island made from a dresser by You're So Martha. As we showed off last month in our suitcase makeover piece, cute dog and kitty beds are all the rage and can be styled to match the interior of your home. DIY Show Off takes it to another level with an adorable detachable parasol that offers your pooch shade in the summer months. If you spy a dresser that isn't in the best of shape at Goodwill, don't dismiss the piece. Dresser drawers are just as valuable for fun DIY projects. Dare I say, in fact, sometimes even more fun than finishing an entire dresser piece? 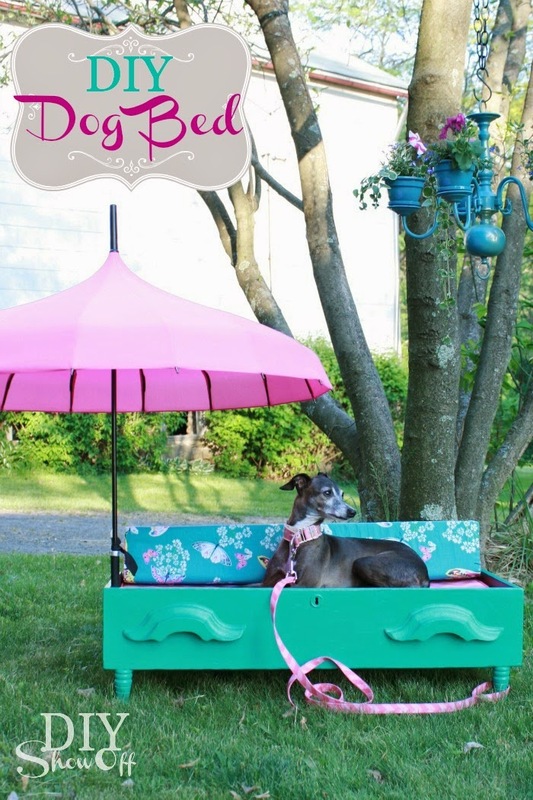 I adore this DIY dog bed and the adorable details for your fashionable 4-legged friends. Who knew girls came with so many costumes? When my daughter was small, our dress-up clothes resided in a drawer in her room that often exploded all over her floor. 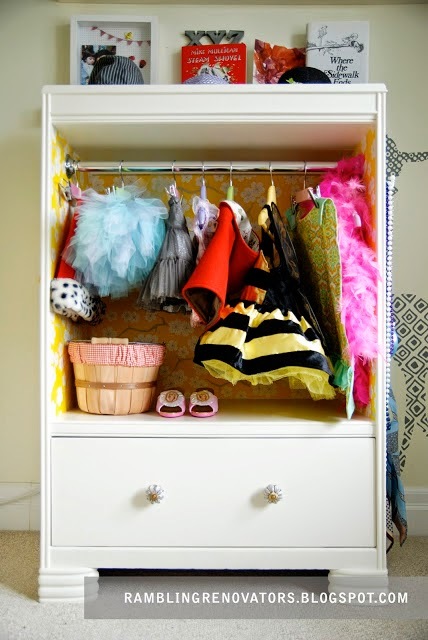 I love the idea of creating a space just for these outfits and Rambling Renovators made a DIY Costume Closet out of an old dresser that is just too adorable for words. I particularly love that there is a mirror on the side for a quick costume check and that there is storage for jewels and footwear. The floral wrapping paper interior also adds a special girly touch that any little girl would flip for. 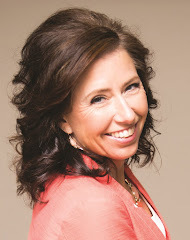 This is a DIY-must for moms of girls! Although I was not blessed with a green thumb, I do have an appreciation for beautiful pieces that add beauty & function to our outdoor living. Although I couldn't find the source for this image, I just had to share this fun idea for a way you could transform a mirrored dresser into a planting station. By adding peg board to the mirror stand, you now have the perfect storage for your gardening tools. The top is the perfect stop for planting, or even for decorating outdoors. The drawers make ideal storage for items like seed packets, small pots, gardening gloves, and your gardening cushion. As we have found with our sixties home, bathroom renovations can be expensive even with the most basic of remodels. Have you ever considered a dresser the perfect source for a vanity? 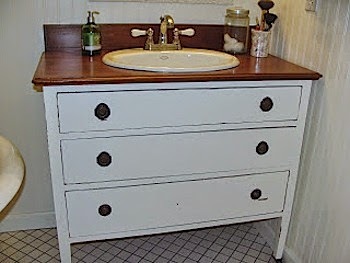 I know I hadn't until I saw this incredible DIY Vanity made from a thrift store dresser from An Oregon Cottage. The best part is that you can customize this to the size of your home, add a splash of color (or not), and a scratched-up tabletop basically disappears once you insert your sink. How fabulous is that? Storage is always something I am thinking about and I love the idea of using dresser drawers for storage particularly in a guest room. 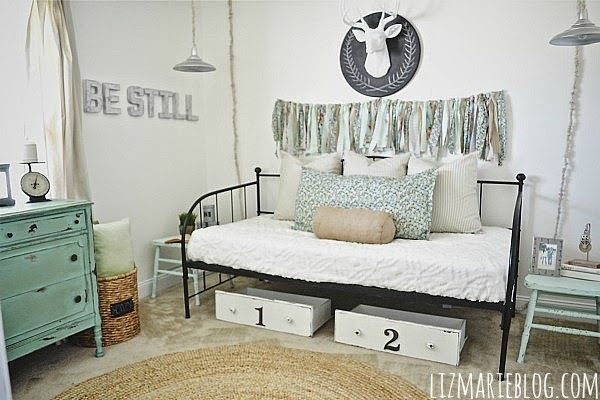 Liz Marie shows off her two beautiful drawers that have been stenciled with numbers as storage underneath the bed. I can picture spare linens in here, a few basic toiletries, or even reading material for a rainy day. Again, look at the bones of the pieces and find what is in the best condition and most valuable to you for your project needs. This is a perfect example of an element you can use from a furniture piece. 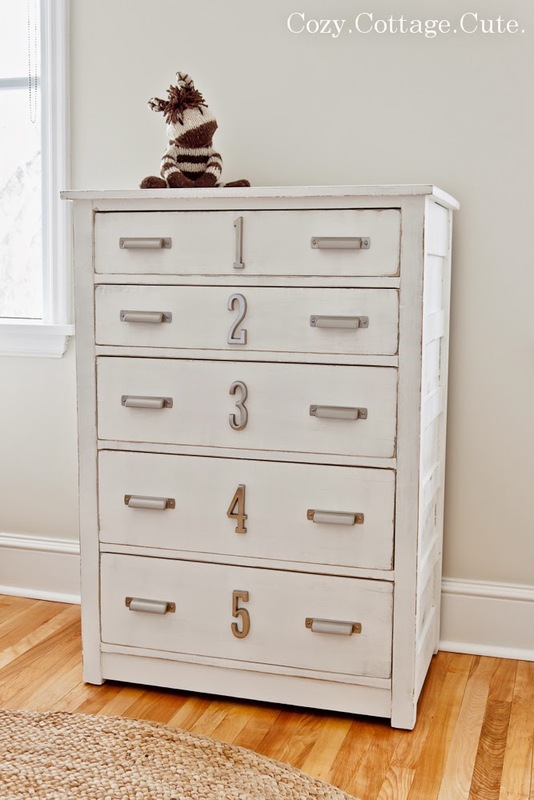 Numbering things continues to be a trend and one simple addition that you can add to a dresser is numbering whether it is stenciled, applying house numbers, or getting creative with paint. 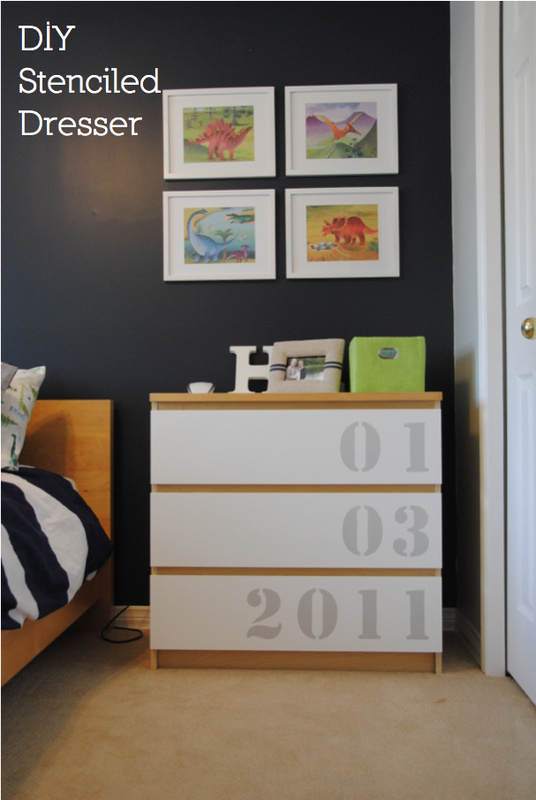 I love this modern dresser makeover with fresh white paint and modern numbers on each drawer from Cozy.Cottage.Cute. Speaking of numbers, I am also madly in love with this numbered dresser that your child's date of birth on it. I found this adorable idea on To London With Love and it makes me want to do this adorable idea on a dresser for my kids. What kid wouldn't love to see his birthday everyday and what mom wouldn't feel nostalgic every time she went into her child's room. I adore this! For today's final idea, I love the idea of looking for unique hardware made from other items you might find at Goodwill. merrythought showcases a beautiful masculine detail on this dresser makeover utilizing leather belts for drawer pulls. The same idea could be used with leather pieces from purses or purse straps too. I love that this is such a simple detail, but can transform a dresser into a real showpiece. 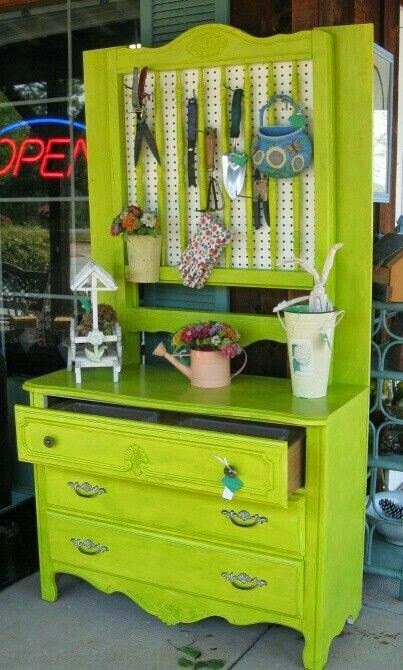 Have you ever made over a dresser from Goodwill? We'd love to hear about it!